What Are the Benefits of Eating Rye Bread for Weight Loss? Rye, a grain closely related to barley that makes a distinctly flavored bread, has particularly positive effects when your goal is weight loss. Rye bread fills you up, suppressing your desire to eat and squelching that gnawing hunger that often occurs when you're on a weight-loss plan. Rye doesn't spike your blood sugar levels, which can cause uncontrollable hunger and diminished energy. Eat too much rye bread, and, like any food, you'll exceed your daily calorie allowance and undermine your weight-loss plan. But, rye bread included as part of a sensible low-calorie diet may help you reach your goal weight. Losing weight requires you to burn more calories than you consume. A combination of moving more and eating less creates this deficit. Eating less, though, can mean you have to endure feelings of hunger. Rye bread can help you feel fuller from meals, so you don't find sustaining the dietary restrictions as overwhelming. Substitute rye bread or rye crisp bread for your typical whole-wheat toast as part of a low-calorie breakfast to support weight loss. The Nutrition Journal published a small study in 2009 that showed a breakfast that included rye bread, as compared to wheat bread, helped decrease participants' hunger for eight hours. Eat rye crisp bread instead of soft, yeast-bread and experience similar satiation effects. 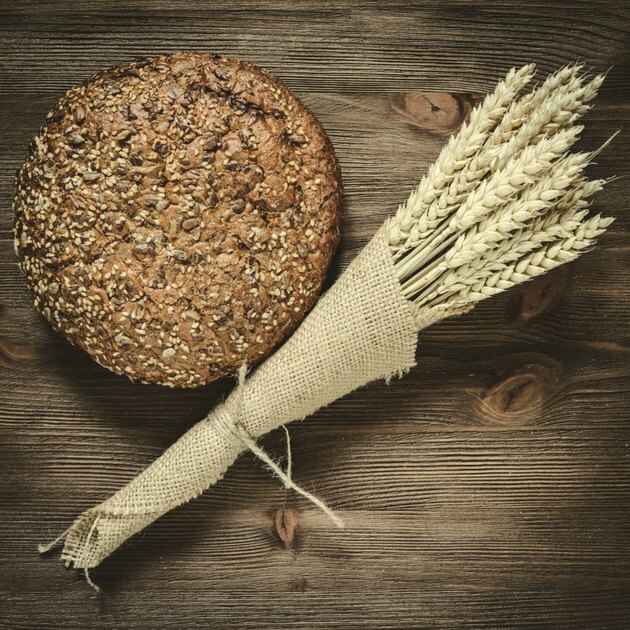 Another study published in PloS One in 2015 found that whole-grain rye crisp bread eaten at breakfast provided participants with greater feelings of satiety and lower blood sugar surges when compared to wheat crisp bread. In 2012, Physiology and Behavior published a study showing that this suppression of hunger from a rye bread-containing breakfast works daily for at least three weeks, suggesting that you don't become immune to rye's satiating properties. Rye bread may also help prevent you from piling on the pounds. Although research is still preliminary, a study of mice published in the journal Nutrition in 2010 showed that choosing rye as your source of whole grains may suppress weight gain. The mice who consumed rye as a supplement instead of wheat lost body fat and had lower cholesterol, despite being fed the same number of calories as their wheat-eating companions. In another study, published in a 2010 issue of the American Journal of Clinical Nutrition, researchers determined that consumption of whole grains, which includes rye, correlates with lower levels of visceral, or belly, fat. Consumption of refined grains, such as white bread and pizza, correlates with higher levels of this inflammatory fat that raises your risk of developing chronic disease. Spikes in your blood sugar interfere with a healthy release of the hormone insulin and can cause extreme swings in hunger. Rye bread may help moderate these spikes, especially when it's consumed instead of refined grains. The 2010 study performed on mice also determined that rye, as compared to wheat, slightly improves insulin sensitivity. A later study published in a 2014 edition of Nutrition Journal confirmed that whole-grain rye bread had beneficial effects on blood sugar and insulin levels when compared to white-wheat bread. Even white bread enriched with some rye flour had better effects than white bread alone, but whole-grain rye versions offered the most benefit. An average slice of rye bread contains about 70 calories and counts as one serving of whole grains. A thin slice of rye crisp bread, measuring about 5 inches by 3 inches, contains just 22 calories. Incorporate either as an accompaniment to eggs at breakfast, as a sandwich containing a few ounces of fresh deli turkey or as bread served with dinner. Just because rye has proven weight-loss potential doesn't mean you can eat it with abandon, though. If you simply add rye to your current maintenance calorie intake, you will gain weight. Rye has a sharper flavor than wheat, which may be disagreeable to some. Light rye breads' flavor is less intense than pumpernickel or marble rye. Almost all rye bread, regardless of color, contains a small amount of wheat flour to provide ample amounts of the protein gluten, which adds body and chewiness to the dough. Darker ryes traditionally got their deep color from the use of whole, ground rye berries, which included the fiber-rich bran and germ, but many are now colored with molasses, cocoa and instant coffee. If you can find rye made with the whole berry, its fiber content and satiating properties may be greater than more refined versions. Why Are Rye & Pumpernickel Breads Better for You? What Are the Benefits of Unleavened Bread?